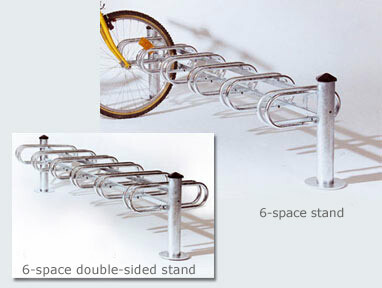 The Mercure 3, 6, 12-space bicycle stands are available single-sided or double-sided. Galvanised steel tube and black painted cast aluminium post caps. Made to fit a maximum tyre width of 50mm to accommodate mountain bikes. Base plates and anchoring rods are supplied.